Only 4 left in stock (more on the way). Ships from and sold by Amazon AU. Gift-wrap available. See, hear and speak to people on your property from your phone, tablet and PC. Shine the lights and start recording video as soon as motion is detected. Sound the 110-decibel siren on suspicious activity. Compatible with iOS and Android mobile devices, and Mac and Windows PCs. Includes all the tools you need to get your cam setup in just a few minutes. Ring spotlight cam battery is the first plug-and-play HD security camera with built-in spotlights, two-way talk and a siren alarm. It lets you watch over your property from your phone, tablet and pc. When anyone triggers your motion sensors, you'll get an instant alert on your phone, tablet and pc. Answer the alert, and you can see, hear and speak to people on your property from anywhere. Spotlight cam battery shines its lights and starts recording video as soon as motion is detected, and you can also use the free Ring app to control the camera, lights and siren right from your phone. It also comes with a free 30-day trial of Ring video recording, so you can review, save and share your videos at anytime with anyone. Spotlight cam battery comes with all the tools you need to get your cam setup in just a few minutes. Ring spotlight cam battery is available in either black or white, so you can pick a finish that matches your home and your style. With a weather-resistant design and infrared night vision, you can monitor your property at any time of the day, with or without the lights on. I absolutely love these cameras. I already had the ring doorbell and needed some extra surveillance in the common staircase cos my neighbour tenant is very nasty and likes to wreck my business signs and steal my stuff. I didn't want to install anything that required an electrician and this is the perfect solution. It comes with 1 standard battery for each camera but I bought an additional 4 batteries to utilise both battery slots in each camera and 2 spares to swap out the battery when necessary. I would say that the device can run on a pair of batteries for 2 to 3 weeks without replacement in a medium traffic area. It is also pretty easy to change the battery (provided you don't install it in super high places) and the Ring app is amazing at informing me when someone is in the building. 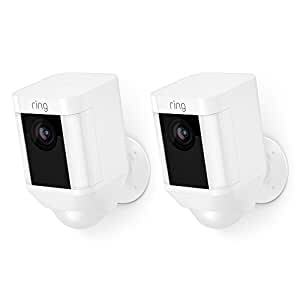 It is also great value to get this 2 pack and it is one of the most reliable and cheap solutions out there for surveillance. The only negative is that the camera that is a bit further away from the wifi source in my office do suffer from some connectivity issue. I tried using the Chime pro extender to increase the wifi range but that thing totally did not work for me and just refuses to connect. If you have to go through too many walls or the distance is too far, this may not work well for you. I have had these cameras for 7 months and have had to replace them 3 times under warranty. There appears to be a critical bug where if the internet drops out the cameras freeze completely and refuse to reset. At least in my situation it refuses to reset. I have been through troubleshooting with the ring team multiple times and each time they've just replaced the cameras without any idea as to what is going wrong. Very frustrating as its pointless to have cameras which are not reliable. It does what it does well. Installation was easy due to user friendly design. Only down side is that it requires strong wifi network for it to perform. If the intruder shuts down the power system , it will basically not be able to do anything. So if the spotlight accepts a sim for broadband, it would be ideal.